A series of five postage stamps of delicate beauty appeared in Bulgaria's post offices on 1st May, 1879 and they marked the beginning of postage stamp issuing in Bulgaria. This delay of about three or four decades, as compared to the other countries in Europe and America, may be explained by the fact that till 1878 Bulgaria was under the rule of the Ottoman Empire. The stamps forming this first series were of identical dimensions and design - a heraldic lion placed in a regular oval. They are known as the "centimes". Their name comes from their nominal value (5, 10, 25, 50 centimes and 1 franc), as the stamps were printed in compliance with the Latin Monetary Union system, since by June 1880 the young Bulgarian state did not have its national currency unit. The series was printed in St. Petersburg, Russia; the author of its artistic design has remained unknown. The year of 1879 was also the year in which the first Bulgarian post card appeared. After the introduction of the "lev" national currency (1 lev equals 100 stotinki) two series, fully identical in appearance with the "centimes", went into circulation: "Parvi (First) stotinkovi" (1881) and the "Big Lion" series (1882), the latter had several emissions. Curiosities are found in both of them making the series popular among stamp collector, as well as among... forgers. In 1884 an excess value postage stamp, known as the "serpentine", appeared - its perforation was made with a paper-puncher and has no like in the world stamp-printing practice. The first commemorative series was issued on the occasion of the 25th anniversary of the 1876 April Uprising. It made, in 1901, the Bulgarian Post Office one of the very few in the world issuing thematic stamp series. As a matter of fact, series in memory of the national liberation struggle, together with the sports theme series (the First and Second Balkan Games, the Fifth Football Tournament), and the portraits of the Monarch were predominant in the entire period preceding World War II. Between 1930 and 1937 the first four commemorative blocks were issued with a circulation of 20 to 200 pieces. By 1944 the Bulgarian Post Office Administration set into circulation more than 400 different stamps. In the subsequent decades the range of topics in stamp printing became increasingly wider and more diverse, covering extensively sports, science, flora and fauna, transport, history, arts, etc. Of special value are the series and blocks dedicated to important philatelic events at home and abroad. By the end of the 1990's the total number of Bulgarian postage stamp issued has exceeded 3 500. 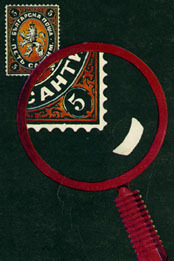 Stamp-collecting in this country preceded the issue of the first series in 1879. The pioneers of philately in Bulgaria were foreigners working in the country, as well as Bulgarian businessmen and students who developed that passion during their stays abroad. In 1878 Teodoraki Toshev from Vratza exhibited two panels of postage stamps in his private museum collection. In 1893 Samuel Blaustein presented his collection of 100 000 postage stamps at the World Exposition in Chicago, U.S.A., with a commercial purpose, indeed. The first philatelic periodical - a monthly newspaper called "Timbrophil" started coming out in 1881. The first stamp collectors society was established 12 years later in Plovdiv. By the 1920's in all the bigger towns and in good many of the smaller ones the stamp collectors had already established their own organisations and, often, their periodicals. Still, the most authoritative of them was the Poshtenska marka (Postage Stamp) magazine published in Sofia since 1938. In the summer of the same year it became the official organ of the Union of the Philatelic Societies in Bulgaria founded by eight town societies with 500 members altogether (today the Union of the Bulgarian Philatelists). The present Filatelen pregled (Philatelic Review) magazine, organ of the Union, is a successor of the Poshtenska marka magazine of former times. Even before founding the Union, organized Bulgarian philatelists joined the International Philatelic Federation in 1936. The first national exhibition was organised in the capital city of Sofia in 1930. An exhibition with international participation was held for the first time in 1947, also in Sofia. Bulgaria hosted the World Philatelic Exhibitions in 1969, 1979 and 1989. In addition to the three-volume modern catalogue of the Bulgarian stamps, the bilingual SIMA (with 16 editions between 1938 and 1959), as well as DIGE (with 6 editions in the period of 1937-1946) are considered to be of good authority.